A week ago today, I was watching the Boston Bruins on the brink of yet another crushing series loss that had started so well. Even winning a Cup in the meantime, there is still a bit of a sting from the colossal failure when we were up 3 games to none on the Philadelphia Flyers, and they came back to force a game 7. In that game, we were quickly up 3-0, but ultimately lost and went home for the season. This time around, we were up 3 games to 1, and couldn’t finish the Leafs off in either building in games 5 or 6. The Leafs outplayed us, for sure, in those two games, and for most of game 7. In fact, halfway through the 3rd period, down 4-1, I had completely written the Bruins off. An up-and-down, inconsistent series with lackluster effort from the players who should matter the most, and most of sports talk radio convinced that if they lose game 7, Claude Julien would be packing his bags in search of a new coaching job. In anger, I told the twitterverse that I was going to switch to the other game 7 between the Rangers and the Capitals, if for nothing else than to enjoy watching the lazy, cherry-picking Ovechkin prepare to line up his golf schedule. But something in me prevented me from changing the channel. Surely, you know the rest of the story. The Bruins flipped some kind of turbo switch, producing an offensive onslaught that had never been seen in NHL history: coming back from 3 goals down in the 3rd period of a game 7 (the Flyers’ comeback against us started far earlier in that game). Patrice Bergeron may not make the hall of fame, but he will forever be a hero to the “Boston Strong” crowd. Not only did he tie the game up with less than a minute left, he also scored the winner in overtime. It remains to be seen how the Bruins will fare over the remainder of the playoffs, currently up 2 games on the New York Rangers. But this was a phenomenal hockey story that I just had to put into my own words. Sorry, this particular post is not about Madeline, though I miss her very much! I am currently in Manchester, UK, heading home tomorrow. I’m on a work trip but got to see a variety of sights while I’ve been out here, including Yorkminster, Clifford’s Tower, and Wayne Manor from the most recent Batman movie. 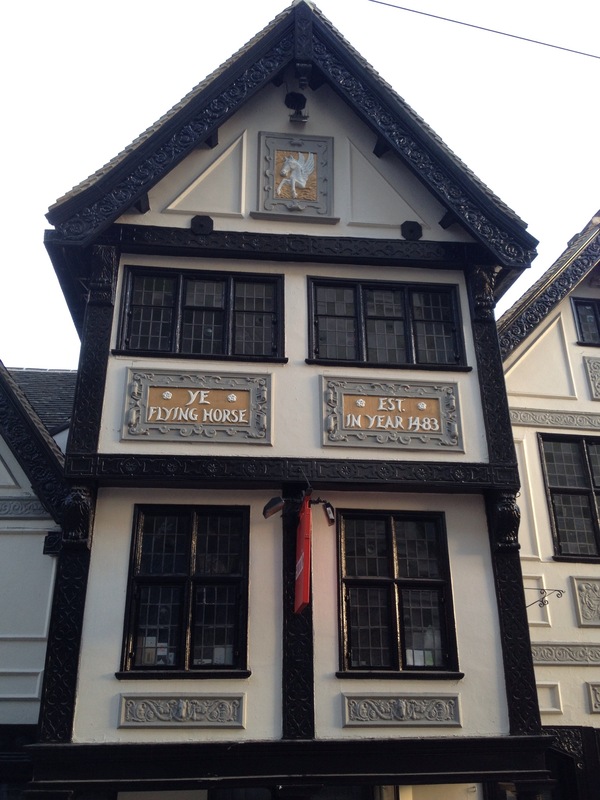 The Flying Horse, a pub in Nottingham dating back to 1483.